Real Easy: The reels pop into the handle without any fuss. Press the reel into the handle and retract the grippers to lock the reel in place. Plus, if you use the regular matrices (yellow hubs) they can be easily pushed through contacts. Real Tight: Tight contacts and excellent contour are what ReelMatrix™ is all about. These thin matrices are pre-contoured in three dimensions and when combined with anatomical wedges and separator rings, the result is amazingly tight contacts at the natural height of contour. Real Fast: Pre-loaded reels mean you can just lock them in and go. The retainerless design greatly speeds up quadrant work while improving visibility and patient comfort. Add a 3D XR separator ring and you virtually eliminate buccal and lingual flash. NEW! 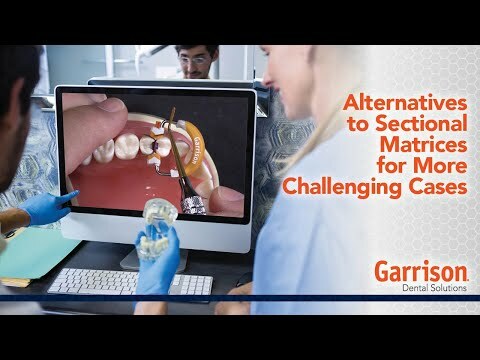 The ReelMatrix Margin Elevation matrices allow proper adaptation and seal of deep areas so that a composite margin elevation can be performed.